There comes a time in every home cooks life when you really, really, really have a hankering for pizza. Except dinner is in 30 minutes. And you have no store bought dough. And no time at all to put together a dough, let it rise, etc. Might I suggest this pizza bake as an alternative?! It’s sure to cure that craving and it can be on the table in 30 minutes or less! Here’s how it looks. Boil the pasta…10-15 minutes, depending on the kind you use. While the pasta is boiling, cut the pepperonis and the peppers and get out the cheeses. Drain the pasta, reserving about 1/4 cup of the pasta cooking water to help thin out the pizza sauce. Put the saucepan or Dutch oven back on the burner with the water, pizza sauce, peppers and pepperoni and let cook for 2-3 minutes. Reintroduce the pasta, toss, top with the cheese and then bake for about 10 minutes, or until cheese has melted. 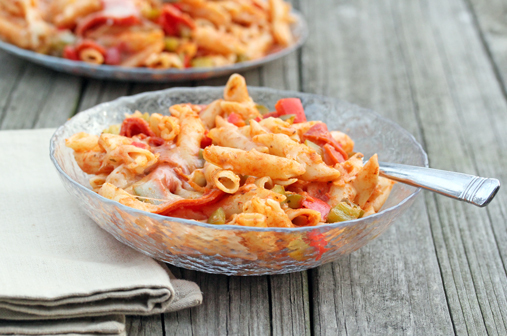 Pasta, pepperoni, pizza sauce, peppers and some pizza blend cheese…cooked all in one dish! Cook the pasta as directed on the package in an ovenproof saucepan or Dutch oven. Save 1/4 cup of the cooking liquid and then drain. To the same saucepan or Dutch oven, add the reserved cooking liquid and the pizza sauce and whisk together. Then stir in the chopped peppers and halved pepperonis and cook for 2-3 minutes. Add the drained pasta noodles. Toss together. Sprinkle the Parmesan cheese over the pasta and then sprinkle the pizza blend shredded cheese over top. Bake in the preheated oven for about 10 minutes, or until cheese begins to melt. Serve Pizza Penne Bake with tossed salad. Love everything about your website!!! I love this website too. I have learned alot! We tried this last night and it was wonderful!! I love all your recipes and you have helped me to get my grocery bill down a lot. Thank you so much!! Thanks for the easy, quick meal ideas! I Love your website. Hi Have made this dish for a few years now and it works very well in a crock pot. cook the pasta then layer everything in the pot and cook on low for about an hour or two.